The Med-Asian revolution is here. For years we have secretly known that people living in the Mediterranean and Asian regions of the world have better health profiles and longer life spans. Their diet definitely plays a huge role in conjunction with regular incidental exercise ( you don't own a car in Tokyo or Rome - let alone drive one!!) and strong family values - eat, play and stay together. If you opened my pantry and fridge you would see staples such as olive oil, olives, capers, tinned tomatoes, soy sauce, wasabi and Nori- not to mention basil and coriander (if anyone can tell me how to grow this frail little herb I would be forever in your debt!). Two of the easiest meals I prepare for the family are pasta and sushi (master J and Miss R had their school disco tonight and they both went off with a belly full of sushi - whipped up in 10 minutes. it is one of the easiest and healthiest meals or snacks to prepare (try my recipe below). High in fibre, omega 3's, low in saturated fat and full of vitamins - you simply can't go wrong. 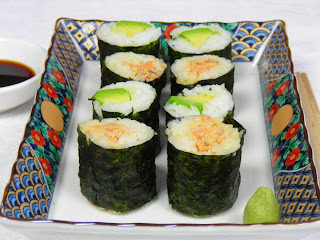 for those who are not sure about sushi you can make a westernised style using plain avocado, cooked chicken or cucumber in the Nori rolls - however try some raw fish you will be pleasantly surprised by the lack of a fishy taste!! PS Remember that Sushi party you had for all of us... and the rice on our feet?